a collar with current ID." 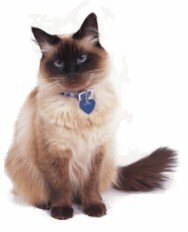 Does Your Cat Need to Wear Identification? Every cat should wear a safety collar with a current pet ID tag. Even your indoor cat should wear a collar with identification. Those of us with indoor cats never expect our cats to leave the home, but there are numerous ways that our cats can get outside (e.g., natural disasters, fires, unaware repairpersons, careless children, etc.). Indoor cats are particularly susceptible to getting lost if they suddenly find themselves outside and disoriented by unfamiliar surroundings. A collar with current information may be your cat's only ticket home in case of an emergency. According to the Humane Society of the United States, cats found wandering without visible identification have a tragically poor track record of being reunited with their people. Many of these unknown and unclaimed cats will perish in shelters while their "owners" search frantically. What Should You Put on Your Cat's ID Tag? Your cat's identification tag should have your name and phone number and your cat's name. You may also want to include your address. Be sure to keep all information on the identification tag current and legible. Identification tags are made from different materials, such as stainless steel, sterling silver, brass, or reflective plastic. Be sure to check the tag occasionally to make sure it's securely fastened to the collar and that the information is still legible. All Cats Need Safety Collars and ID Tags! An identification tag helps your lost or injured cat get home. Without identification, your cat has very little chance of being returned to you. Even indoor cats need identification. For their safety and protection, all cats should wear a collar with an identification tag! For added security, you should also consider "microchipping" your cat. Microchips are small computer chips injected by veterinarians under your cat's skin. The microchip contains information about your cat to help him make it home to you. Cat Supplies - List of essential cat supplies and best places to buy on the internet.